Around my department, several folks had water eyes, runny noise, sinus pain, and a cough. 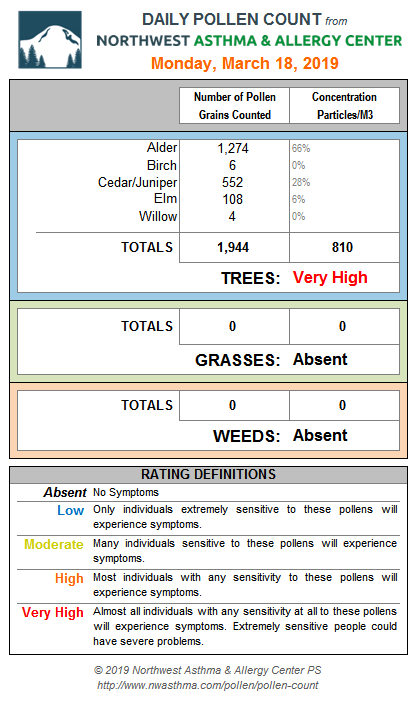 And it is all due to a massive and sudden influx of tree pollen, aggravated by very unusual weather conditions. The initiator of these discomforts? A rapid increase of temperature accompanied by dry conditions and lots of wind. 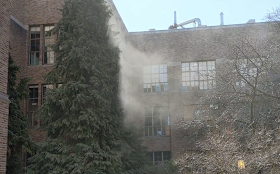 One of the department sufferers (research meteorologist Jeff Baars) send me a video showing massive pollen coming off a cedar tree. Take a look...you won't believe it. He though the tree was on fire. The link to the video is here. 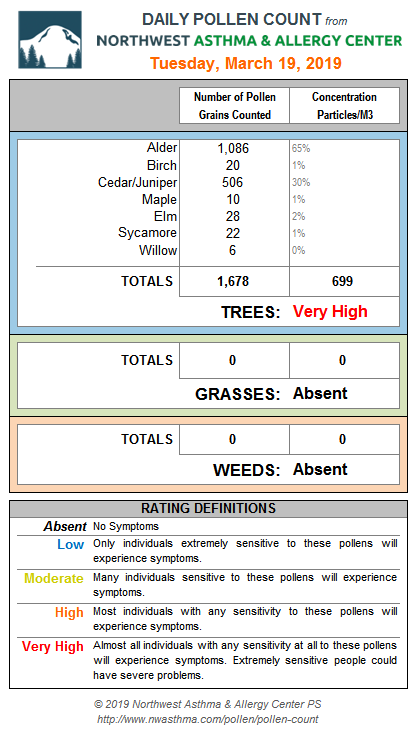 The local tree pollen numbers were very high today and yesterday: 810 yesterday and 699 today, as reported by the NW Asthma and Allergy Center. 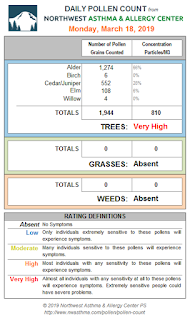 The pollen season onset was slowed by the cool temperatures in February and early March, but the rapid onset of well above normal temperatures has caused trees to release large amount of pollen. The last few days have been dry--so no rain out--and the unusually strong easterly winds, particularly today, pushed clouds of allergens into the air. Not suffering enough? The warm easterly downslope flow produce stunningly low relative humidity, in fact the driest air of the last year at Sea Tac Airport. Want the proof? Check out this plot of RH for the last 12 months--it dropped to under 12% today. Another reason to have a dry cough. And then there was the torrid temperatures of 79F at Sea Tac. The warmest March day on record in Seattle (with a record going back to 1891). And did I mention the wind? Gusting to approximately 35 mph at Sea-Tac from the EAST. This is quite unusual. All and all, a challenging day for some. Lots of pollen, very dry, windy, and extraordinarily warm for March. 12% humidity?? That in itself is absolutely amazing... especially at SeaTac... You have to love our weather here.. never a dull moment..:) I am surprised we did not have any grass/brush fires..
Cliff: I'm surprised you insist on using relative humidity when discussing dry weather. RH of course means relative to the dew point, and therefore fluctuates with the actual temperature. So, for instance on a dry day like yesterday, with the same air mass in place, the relative humidity could vary from 10% late afternoon to near 100% at dawn. The dew point, however would remain constant, and therefore a much better measure of the atmosphere's water content. Yes- I noticed the pollen. It was all over my car when I got back after a week in Florida, during which Washington seems to have gone from winter to summer in a week- reminiscent of New England where I used to live. Yesterday it topped out at 80.1 degrees at my house on the Mill Creek line! The highest I have ever seen in March here. And it was strangely similar to New England in that the first warm spell often happens while plant life is almost dormant. Even my lawn is still dormant. Not our usual regime where things usually grow while it is still very cool- but my crocuses are done, and the irises are coming up. Hyacinths are drooping- the sudden warmth has confused them. I am actually looking forward to the next rainy spell. 33.9F in NW Bellingham this morning. Looked up at the Chuckanut (near Bellingham) and saw what I thought was a light fog. But the conditions were not right for fog and I was scratching my head as to what was going on. Looked on the car and saw a bunch of pollen. Case closed. Wondering why there is no marine push with the change in weather. We usually see a good westerly blow when we move from hot to cool. I am sure you could explain. With the addition of a zillion (big number) fast growing non-seed bearing male clones being planted all over the place in windbreakers the pollen situation is skyrocketing. 68.9 this afternoon in NW Bellingham. I’ve been taking Claritin during the day and Benadryl at night. Still sneezy and itchy here in the Willamette Valley. Ready for the rain to come back. Any intel on why SeaTac airport has been so warm at night? The highs there 79 F the last two days, are consistent with other regional temps, but the lows: 59 and 54 F, respectively, are really out of whack. Here in north Tacoma, we've had 44, 45 F, and we're at 350 F (not different from Seatac), but also only a mile from water. Olympia has been 28 F (but they seem to always be in a cold pocket at night- or at least where the official temp gauge is located). Also, the other Seattle temp gauge (Magnuson Park??) shows low temps similar to what we've been seeing in Tacoma- mid 40s F.
37.1F this morning in NW Bellingham. Only 2 days so far this month with minimum temps at or above normal. SeaTac is a big, open area and probably windier than the other locations you mentioned. The wind mixes cold air near the surface with warmer air higher up. Just a guess, though. Note, sometimes farmers will place huge fans in their fields to prevent frost damage. Who knows, maybe the turbulence from aircraft is on par with the big fans farmers use in their fields? 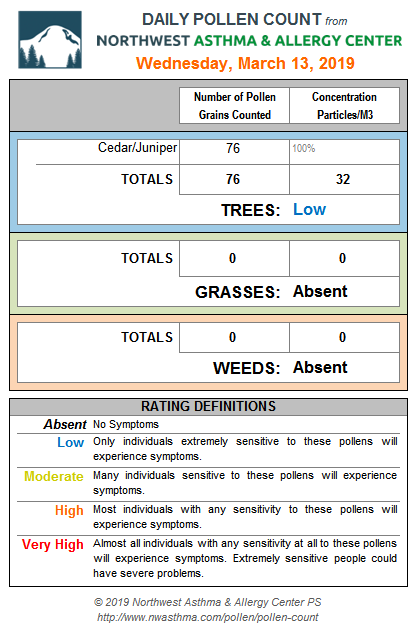 How can I get to the detailed pollen count numbers shown in the pictures? 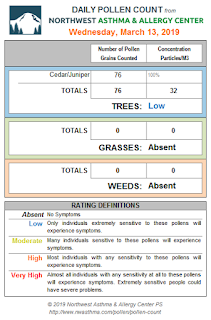 I tried the url in the image: https://www.nwasthma.com/pollen/pollen-count/ which just redirects to https://www.nwasthma.com/pollen-count/. 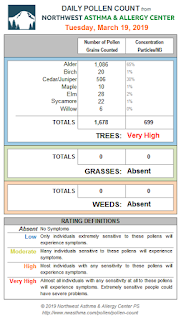 That only shows an aggregate pollen count for Tree.